Hey bike-share system owners and operators, this post is for you! It is said that something doesn’t matter unless it is counted. According to The Bike-sharing World Map, there are nearly 900 bike-share systems worldwide, yet how are the systems performing globally and how is your local system doing? How many trips are being made? How many people have used the service? How many kilometers or miles have the bikes been ridden? 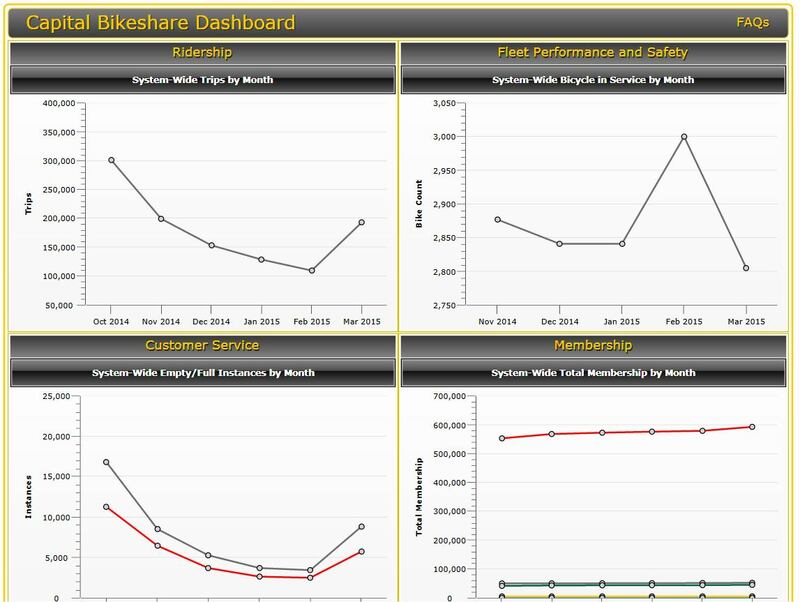 Some bike-share systems make their anonymized ridership data publicly available either as large database files or through a more user-friendly “dashboard” as the Washington, D.C. Department of Transportation has done for Capital Bikeshare (image below). Many rail and bus transit systems have been doing this for much longer than bike-share systems. Now it's time for bike-share to step it up and do an even better job of reporting to show the contributions the industry is making and prove we are here for the long-term, rather than just being a decade-long fad. There is a grace period for infant systems, but as systems mature into adulthood, we need to be doing the same info sharing that other transit systems are providing. In fact, we should do better. 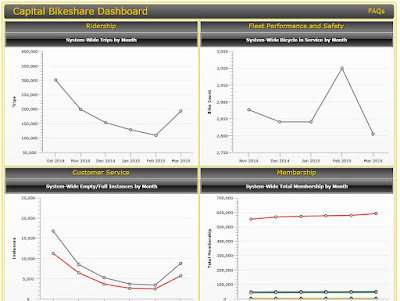 To document this data, the North American Bike-share Association and its members have created the International Bikeshare Database to collect and share important information about bike-share services in a user-friendly format for the benefit of its members and the general public. The Database has the goal of being the prime source for bike-share data for comparative purposes for those within the industry, for academic purposes to foster research in the nascent field, and anyone else who cares. Data about participating bike-share systems is provided with its latest fiscal year information, monthly trip and estimated distances, and a glossary of terms to assist the industry develop its vocabulary. It's rare that a totally new form of transit comes into existence and since bike-share has done so, it needs to follow best practices in the greater transit industry and develop its own best practices within its subset of the transit industry. This is an opportunity to use some of the best practices that pre-existed bike-share and develop specific ones that apply only to us. Most of the folks I know who have come to this industry are coming with a bike background, rather than transit background. This is bringing in lots of new thinking into how to develop the industry. Having an industry-wide resource, such as The International Bike-share Database, is necessary. The Database is similar to the National Transit Database which is for U.S. transit systems, but does not include bike-share... yet. The Database is starting off small, but hopefully will grow as the number of systems in North America grows and evolves.